I do so by identifying my target finish time, finding previous finishers with similar times, and then averaging out their aid station-specific arrival times. For instance, I might plan to hit an aid station at 3:45pm if similar finishers in years past arrived at 3:38pm, 3:41pm and 3:52pm. I've had a number of friends ask me to help them develop their own race plans and, in general, the response has been really positive. I thought, then, I'd share my methodology with the general running public. 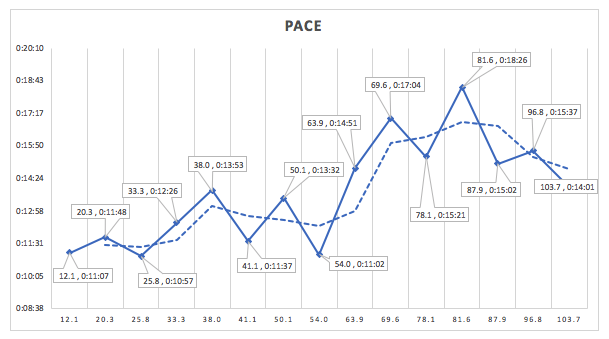 And here is a graph of my pace over the 103.7-mile course. The solid line is my exact pace, while the dotted line is a rolling average of my pace. The hump you see toward the latter-half was, not surprisingly, fatigue and nightfall. Going forward, we're planning to gradually post "how to go sub-24" race plans for various 100-milers.